Michele Roberts, Executive Director of the National Basketball Players Association, spoke about her professional journey as well as some current issues surrounding the NBA. 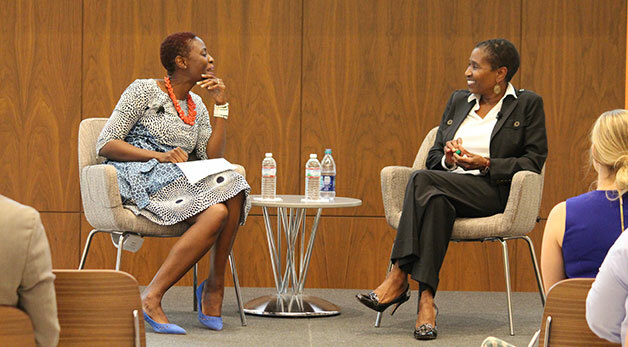 The talk, structured in a fireside chat format with Acting Dean Osamudia James, was co-sponsored by the Entertainment and Sports Law Society and the University of Miami Libraries. She rose to become Chief of the Trial Division at the Public Defender Service for the District of Columbia before moving to private practice after eight years. In 2014 she was elected as the Executive Director of the NBPA. “I knew basketball because I grew up in New York,” she said. “But I never envisioned having a position in sports.” Roberts has nevertheless thrived in her role, and was unanimously re-elected as Executive Director in July of this year. Roberts discussed the NBA’s controversial one-and-done rule, which stipulates that athletes must wait at least a year after high school before declaring for the NBA draft. An initiative of the league, the rule has faced heavy pushback from the Player’s Association, which has made progress towards overturning the rule. “I know that’s going to be one of the next big issues for collective bargaining,” Acting Dean James said. Critics have argued the rule is disruptive to players’ careers and to college basketball. Many athletes opt to play at the college level for a year before dropping out and joining the NBA; some choose to play in Europe before returning to the United States. Roberts went on to talk about the salary cap smoothing, a controversy prompted by the League’s attempts to artificially depress athlete salary caps following a multimillion-dollar windfall for the NBA resulting from new television contracts. The NBPA hired two separate experts to predict the outcome of such a salary model. “They both independently came back and said what you’re essentially going to be doing is keeping money out of players’ pockets,” Roberts said. She rejected the proposition on behalf of the union. “As a young lawyer I knew that I was not a master cross-examiner, but that didn’t stop me from wanting to be a master cross-examiner. So I found out who the people were that were good at it and I watched them and I spoke to them and I learned,” she added.